Sound Module, Which is best for your home recording studio a synthesizer or samplers? What is the difference? With a synthesizer you can create sounds from scratch. It uses digital chips on the motherboard or oscillators to create the sound. 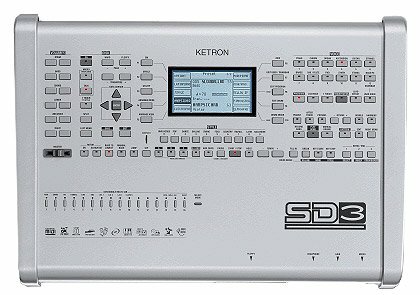 You can have a synthesizer with a keyboard or a software synthesizer. With samplers the sound is recorded with the sampler, this prerecorded sound can be played back using a keyboard. You can have software or hardware samplers. Both are normally included in the DAW that you will be using. Flagship DAWs might have one soft synth included but normally have three are four different types for creating different sounds. Cubase 5 has five different synthesizers include with the DAW, Prologue, Spector, Mystic, Embracer and Monologue with these synthesizers you can create a variety of sounds, so you really don't need a hardware synthesizer. Cubase 5 also has three different samplers, HALion ONE which has 600 sounds, 58 drum kits and a GM(General Midi) sound set. Groove Agent ONE which is sampled drum kits for creating different drum styles. And LoopMash which is sampled drum sounds for creating loops. This is just one example of what you get with your DAW. include different types oy synthesizers and samplers. Which is best for your home recording studio?Both synthesizers and samplers are best. As you get both with your DAW and they each will create sounds that you can use. You can easily upgrade later if you need better sounds. As you can purchase a high quality software synthesizer and/or samplers from software manufactures. But I wouldn't rule out a hardware synthesizer or sampler as there are very high quality hardware units you can get which produce very good sounds.